March: I read about the origins of our harvest festival in Leviticus, and was challenged by my apathy towards the festival. Had a clear idea of how the weekend might be planned. Decided to wait and see if idea faded or grew. Next Sunday: As I sat in my church, I could clearly see how it might be decorated and arranged for a large family supper. Began to feel rather excited. My idea/vision was not fading. April: I chatted to J and C in church, and they agreed to help me plan the event. We met one evening, and I splurged out my ideas. They then discussed what they thought would work, and what should be dropped, and generally improved on my basic thoughts. One idea which they modified was my “Thank you table,” which they thought had too much potential for precious items being lost/spoiled. They suggested instead a “thank you tree,” where people could write their thanks on autumn leaves, and attach them to the tree. They also said there was too much for one evening, and they didn’t think my ‘sacrifice table’ would work, so we dropped that idea. May/June: We met a few times. C planned some attractive fliers, which we could use to advertise the event. 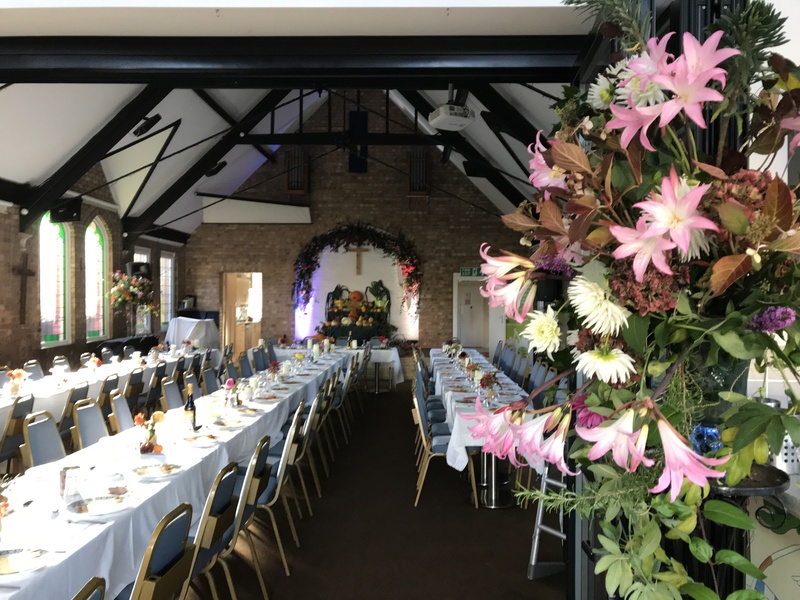 She also booked the church rooms for the evenings we needed them, and managed to book DJ to do the demonstration (which was brilliant news). Rev P let us know that all the families I’d hoped would return had accepted the invitation. Very exciting! 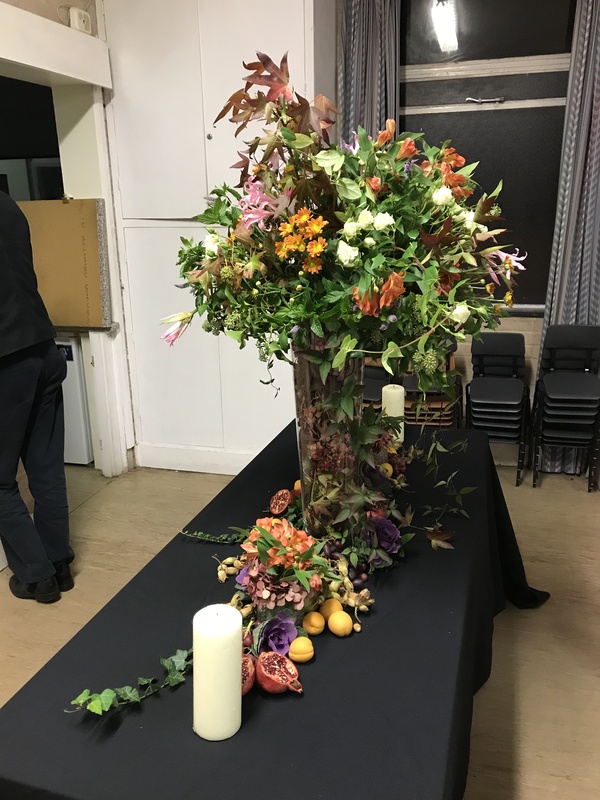 We split the event, so each of us was leading a specific area: C would arrange the flower arranging demo on the Thursday evening. J would head-up a team to decorate the sanctuary ready for the meal/service. I would organise the catering. July: We finalised the design for the fliers, setting the times for when we thought the most people would be able to attend (needed to juggle people who work on Saturdays with those families who are on an early clock). J told us the ‘thank you tree’ was under control, and she had ordered some rather smart autumn leaves. We discussed whether to have a flower demo followed by a workshop, or whether to split that over two evenings. We then realised we were suggesting people came Thursday, Friday, Saturday and Sunday to harvest events, and this might be too much for most people. Decided to drop the Friday workshop, and instead decorate the church Saturday morning. We started to announce our plans in church, giving people advance notice. Husband told me my announcements were mainly confusing (always get very honest feedback from family). We spent an evening at the church measuring tables and rooms, deciding on the layout of the tables. 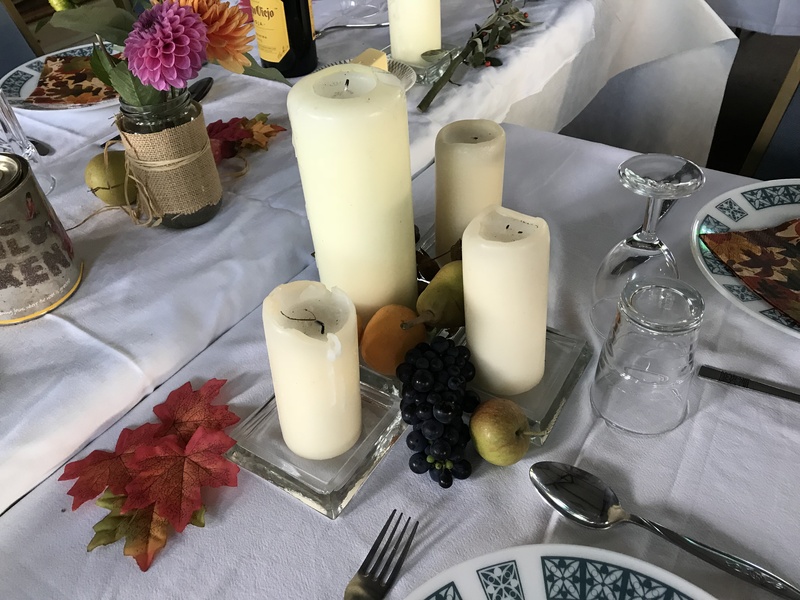 We would have the demo in the back hall, and use the sanctuary (which is a lovely space) for the meal, arranging the tables as for a banquet – trying to give the impression of one big table (like a big family meal), even though the space only allowed for 3 separate tables. The supper is a ‘Bring and Share’ supper. People will arrive, and sit at the table with their dish, which they will eat, and share with those around them. This means people with allergies/food preferences won’t worry about the food. It also eliminates the long queue of people waiting to go to the food table (and the need for there to be space for people carrying plates of food). It also means that people who have spent 3 hours cooking something delicious don’t arrive at the table to find only a cold burger and a hard baked-potato. August: We all went on holiday and thought no more about it. 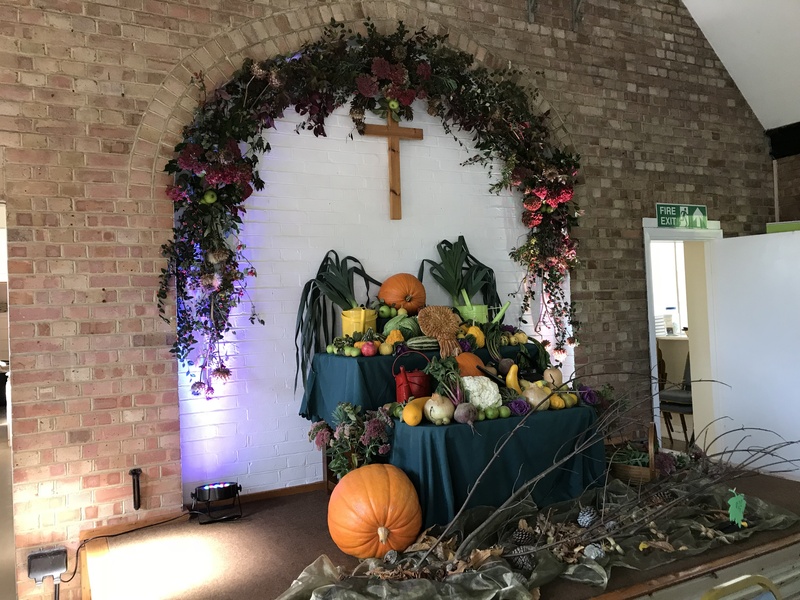 September: Returned from holidays, life became very busy with work/ill parents/health/start of all the church groups, and I began to wonder if harvest was all a big mistake. Very stressed. This was made even worse by reaching the part in my book where there is a barn dance, so I was also planning that (even though it wasn’t real). My head was full of how much a band costs (not real), how many people we could seat in the church (real), what food to serve (both real and not real). All got very confusing. Fliers were printed and distributed. Friends were invited. J arranged a team to help decorate. I tried to find people to help me cater, and printed off a quiz, so people who felt shy/bored had something to do at the tables. The team has grown. We have someone who will wash all the white cloths we use at Lunch Club and return them to church for the Saturday. People setting up games in the hall for the children/young people to use during the meal. Someone collecting and returning wine glasses (borrowed from Waitrose). 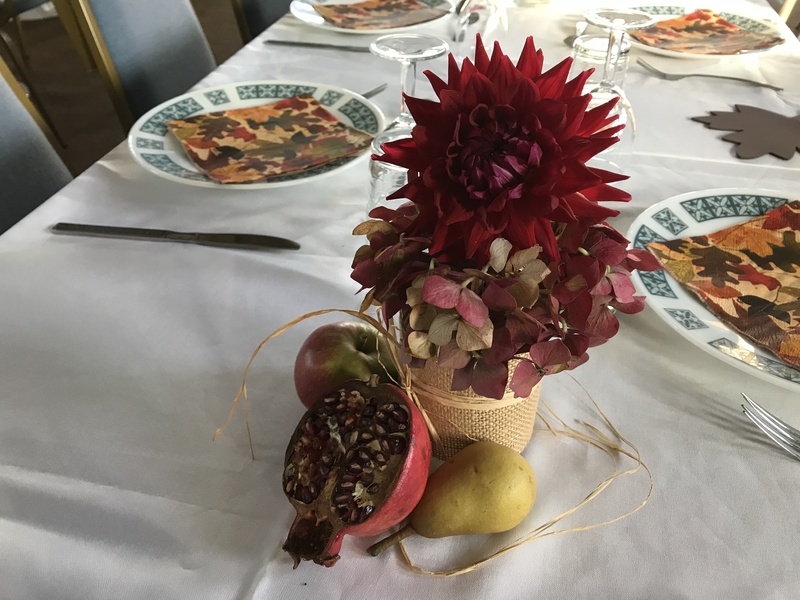 Someone sourcing some autumnal napkins. A team who will help decorate. People who will help set up tables and move furniture before and after the meal, and so on. I am beginning to feel excited. One Week Before: Ordered food from Morrisons (15 stick loaves and 6 gammons) and bought drinks. I also cooked some dishes, and froze them, ready for next week. Other people in the church began to plan/buy/cook what they would bring. Wednesday, day before the flower demo: C phoned to say our demonstrator had pulled out and could no longer come. I was flummoxed. Now what? We couldn’t even let most people know the event was cancelled, as we didn’t know who would have seen our advertising. Son suggested I went to local florists and tried to find a replacement. Chatted to C and we decided that I would pray, she could contact DJ and try to persuade him to still come. I wasn’t sure what to do if this failed. Wednesday afternoon: C phoned and said DJ had agreed to still come (I think there had been a misunderstanding, which C had now sorted). Phew! Thursday 6pm: Arrived at church, just as C and DJ were leaving, having set up his display tables. J arrived, and we set up chairs, refreshments, a place where I could give a 3 minute Tearfund talk (we were collecting donations for Tearfund at all 3 events). J had made mini chocolate brownies, sausages coated with herbs and honey, and tiny feta and olive pastries. I brought wine and soft drinks, J brought glasses. 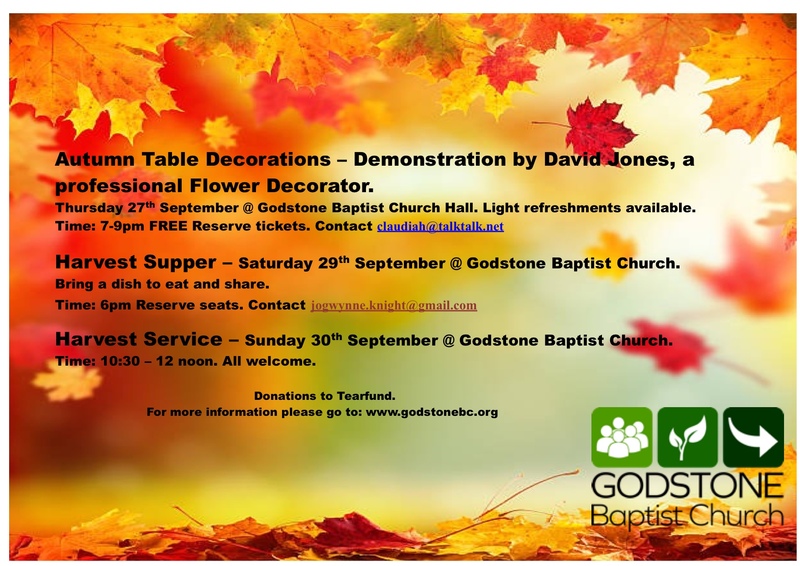 Thursday 7–9pm: DJ gave a brilliant talk and flower demo. About 20 people attended (which was disappointing, as I’d hoped for more). The evening seemed a happy one. We raised about £35 for Tearfund. Friday: Lunch Club. A last chance to advertise the event. Afterwards, on my way home, I bought food, so there would be enough at the meal for our guests (17 people, who were invited to come but who wouldn’t be bringing food as they were travelling a distance). When I got home, I picked some flowers and fruit for the display. Friday evening: Popped into church to check: kitchen was clean, there was a supply of toilet rolls, I filled freezer with ice-creams. The stage was heaped with beautiful flowers and vegetables which people had grown and donated. Saturday morning: I arrived at church to help decorate. People were already there, making the sanctuary look beautiful. Someone had also set up the back hall, with games for teenagers and toys for children. It looked fabulous already! The church began to look beautiful. Inspired by the Thursday demo, I decided to have a go at an arrangement with the stuff I’d brought. The last flower arrangement I attempted, my mum rearranged when she saw it. People were very polite about my attempts (but I could see in their eyes that they were lying). Then D, who is so sweet, said I had started a really lovely shape, and she had some flowers left over, how would I feel if she added to my arrangement? She then added flowers and foliage, and made it look amazing. I decided I would tell my family I had done it. Sent them a photo. Left the church about 1pm. All looks exactly how I’d hoped. Very excited. Went home, sorted the animals, cooked lots of gammons, finished planning what I would do with the children on Sunday. Saturday 6–8pm. People arrived (about 80 people) & everyone seemed to have enough to eat, the atmosphere was happy. I was busy, checking people had what they needed, washing up, passing wine, etc. At one point I glanced into the hall, and it was full of young people playing snooker and table-football and having a laugh. That warmed my heart. Another special thing was the ‘top table’, which I’d worried might remain empty, was full of little girls, who were clearly having a party! Rev P did an entertaining and poignant talk, which fitted perfectly. Cleared up. Lots of people helped, which was great. I got really tired, and at one point needed to rest my brain from all the noise, so sat in the car for a few minutes. Felt seriously exhausted – in the end decided to leave some of the washing up and do it on Sunday. Went home. Sunday: When I went into the church kitchen, to sort out the dirty dishes I’d left, someone had already done them, and everything was clean and tidy. Church was nicely full, and looked lovely. D and I took the older children during the service. We had 13 young people, ranging from 7yrs old to 15yrs, in a fairly small room. It was a great hour. Many of them knew each other from before they’d moved away, so they were happy just to be there. At one point, one of them stared at the 7 year old, and said: “Is she the baby who used to smile at everyone?” (She was!) 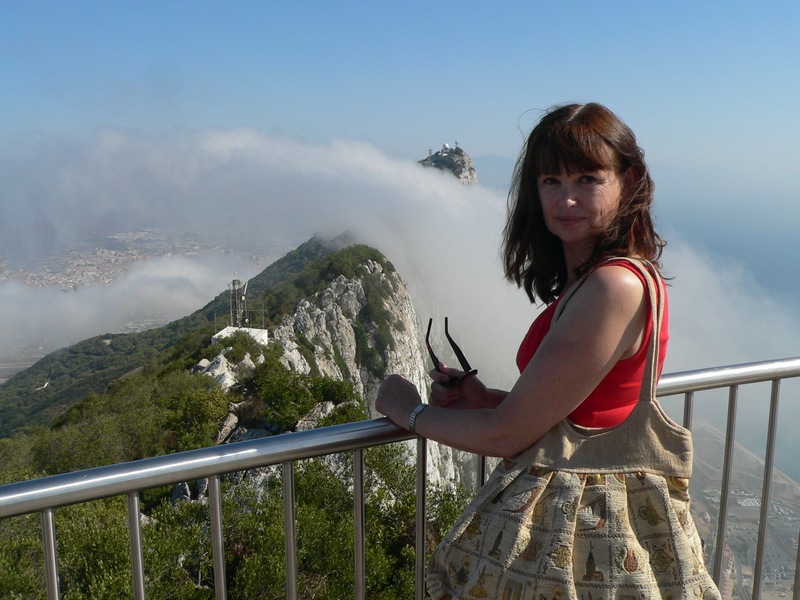 It was so nice to be there, in a sort of slightly disorganised family atmosphere. I did a short talk, then we played a variety of Pictionary/Jenga/Consequences games, the kids in teams of mixed ages. Happy morning. Went downstairs after the service ended (a few minutes late, as the young people wanted to finish what we were doing). The atmosphere was very happy, people smiling, hugging, chatting. I tried to chat, but I was very tired, so I’m not sure I made much sense. Harvest is about remembering what God has done in the past, what he has given to us, so that we don’t forget when times are tough. I think we managed to do this, our church was reminded that God has blessed us, that church is still a family and a good place to be. 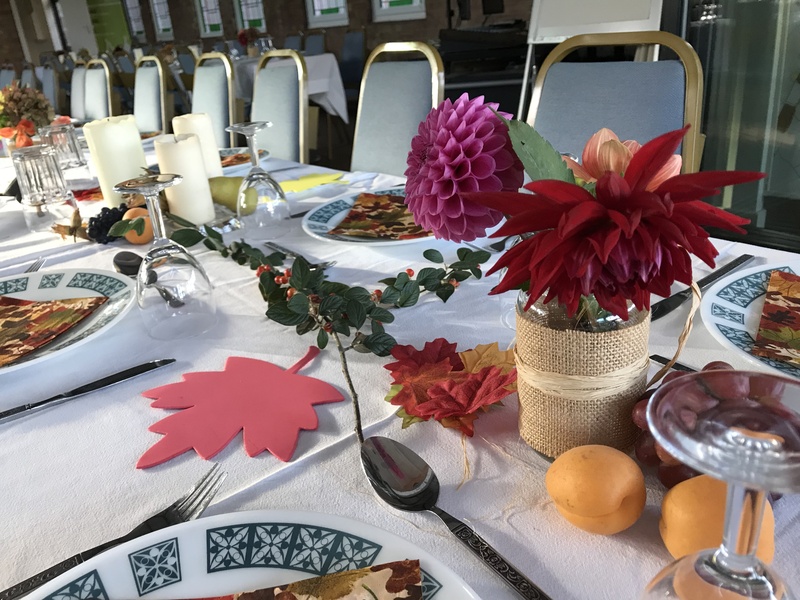 The work before and after was actually a crucial part of this – a group of people sitting together and making table decorations was as essential as the words said from the front. Church is God’s family, and I am happy to belong. After reading this blog; who wouldn’t want to be there. . . .